Once upon a time there was a middle-aged woman who made New Year's resolutions. She resolved to lose weight. Sometimes it happened and sometimes it didn't. She resolved to eat one piece of fruit a day. Often times it happened but sometimes it didn't. She then resolved to cook Bon Appetit's cover recipe each month. So far - it's happened! She had grand family dinners. Dinners with friends. Her table held guests. And then - she realized it was September 29th and she hadn't figured on a date for the meal. Oh sure, she had the ingredients. Oh! 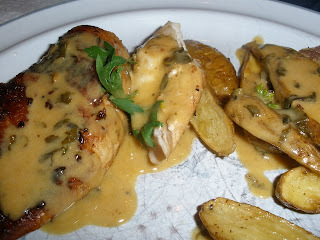 Yes, she had the ingredients - so she made the meal, mid-week for just her and her husband. It came out a wee bit darker than September Bon Appetit's cover, but it was delectable. 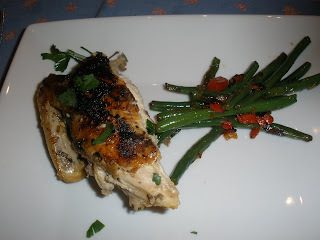 It was Chicken al Mattone from Sfoglia Restaurant in New York. Translated as "chicken under a brick," the cooking of it preserved flavor, moistness and the marinade survived the cooking process. 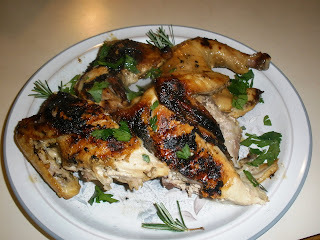 It's a simple chicken recipe: you shmear the chicken with lemon, garlic, olive oil and rosemary and marinate it for a day. Find the recipe here. 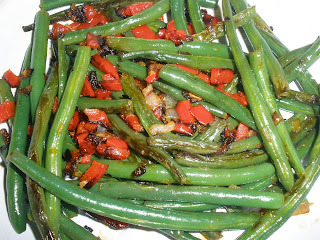 I paired it with some brown rice to soak up juices and some string beans and red peppers which are still to be found locally at our Farmer's Markets. I sauteed them in a little olive oil and that was that. It was simple fare - as a midweek dinner should be. But there was enough elegance to the meal to elevate a Wednesday night into a sweet celebration. 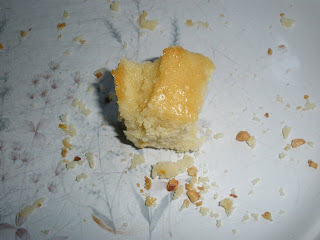 Dessert was an olive oil cake - also from Bon Appetit. The recipe is here. This reminded me of my youth - where you would have a moist cake occasionally - nothing gooey - and nothing overly sweet. A complement to coffee or tea. A biscotti - but in dense, cake-like form. Touched with citrus. Sweet enough for a sweet tooth but not one iota more. There's a crisp outside daring you to bite. And when you do, it reveals that it is a softie at heart. A sunny softie. It didn't make it till the next morning. And so far, this middle-aged woman is living happily ever after. I did my Cover Girl Dinner midweek. And with my gimpy but amazing technicolor ankle combined with sounding like Sneezy-the-dwarf, I was going to keep it simple. And I yearned for a not-gooey dessert but something fresh, moist, cakey and sunny. 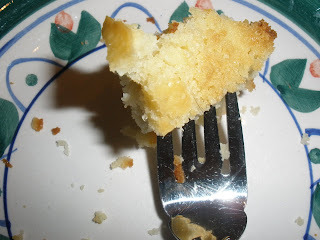 The Olive Oil cake from Abraco Coffee Shop in New York City did the trick. With a hint of orange zest, it soothed without making my teeth tingle, courted me sweetly and gave me the illusion of sitting on a Tuscan hillside. And was gone. The recipe is from September 2009 Bon Appetit. I changed little - except to add some extra orange zest. Preheat oven to 325 degrees F. Oil and flour a 9x5x3 metal loaf pan. Whisk first 5 ingredients in large bowl. 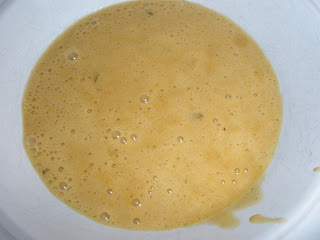 Whisk eggs, milk, olive oil and orange peel in medium bowl. Gradually whisk egg mixture into dry ingredients. Transfer to prepared pan. 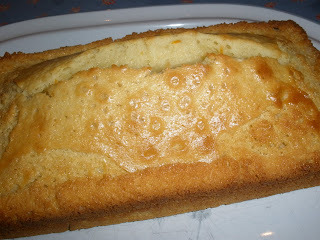 Bake cake until tester inserted into center comes out clean, 60-65 minutes. (Mine took 60 minutes.) Cool in pan on rack 20 minutes. Invert pan to remove cake. Cool completely top side up! Watch it disappear. I no sooner finished my August Cover Girl dinner then I turned around and made a huge French dinner the following evening. Partly because it just dawned on me that in a few years I will be sixty and I am apt to get quite dotty. (I know - I've had fifty-something years to get used to the number 60 and I cannot. So I thought I would start practicing now.) I also had starving-graduate-student-son home for the weekend and thought I would feed him royally while I could. 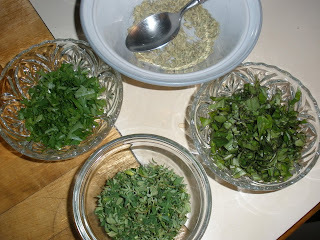 I have a lot of herbs. They're calling to me. "Use me, use me. Why haven't you used me." All summer, it's been their plaintive soft cry but lately they've started to shriek. 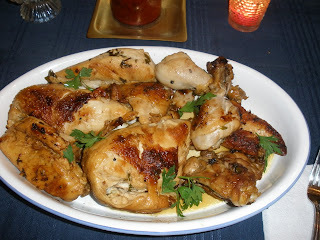 And then August Bon Appetit had some Julia Child recipes in honor of her birthday and there it was: Poulet Saute aux Herbes de Provence! Say that three times - with an Italian accent! 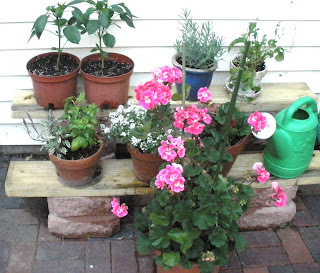 So I picked my herbs (who became quite indignant after being snipped) and went to work. 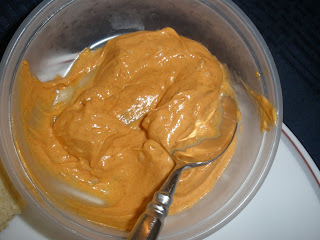 Below is my emulsified Provencal sauce. 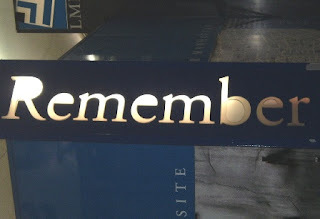 (I know the "c" has a squiggle - I cannot figure out how to do accents on blogger. Anyone know?) That sauce will make you salivate in a way Pavlov's dogs could not. For you are salivating for French food only. Laden with wine (but, of course!) and basil, fennel fronds (I actually have huge, honking fennel fronds). Anyone ready to book Air France pour moi? Oh dear. I hope eating French food does not make me pretentious. Can you feel the bistro atmosphere? Poulet saute aux herbes de Provence beckons. 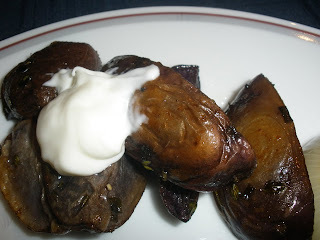 With some roasted potatoes, I do declare - I heard someone say, "It's good enough for company." 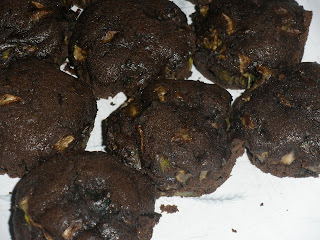 And because zucchinis are still plentiful, we ended the meal with chocolate zucchini muffins. 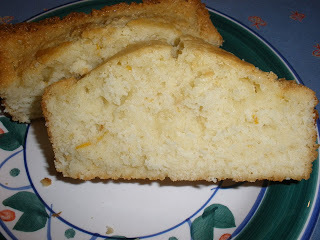 From Barbara Bakes blog. There's nothing like getting a serving of vegetables in your dessert! Deep and rich, zucchini never had it so good. I sweat I tasted a touch of Nice in every bite. It's all French to me! Almost October? Are you serious? Here I was feeling so very virtuous - did the August's Bon Appetit cover recipe last day of August. Post the photos on September 1. All set to blog on September 2nd ... and 3rd ... and well - you get the idea. I think it was the late Labor Day that threw me off. Or the three weeks of eighty-degree days in Minnesota - in September! All the pools closed and it finally got warm enough to swim. But the dinner - was pretty tasty. The cover recipe was a turkey burger stuffed with smoky aioli and topped with grilled peppers, grilled onions and cheese. I paired it with purple potatoes (just because...) and some fresh corn ... wanting to keep the summer grill thing going as long as Minnesota lets me! 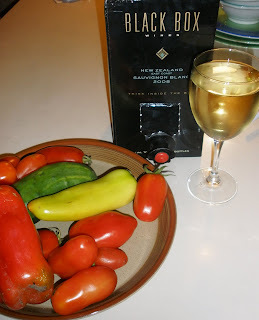 I received a box of 2008 Black Box New Zealand Sauvignon Blanc and used it for quite a few dinners. It's crisp and just a wee bit fruity and paired just swimmingly with the grilled meals. It received approval from all at the table (who were of drinking age). At $24.99/box ($22.99 in Minnesota), it's a bargain to be sure - it averages to be about $6.25 per 750 ml bottle. We poured it with our appetizer - caprese salad. As long as the tomatoes are fresh and my basil holds up - I make this salad ad nauseum. I want my fill of it because when the tomatoes are gone - I don't make it until they return! No hothouse tomatoes for this dish! ... but alas and alack I found the burger not very flavorful. They are turkey burgers and it seemed the aioli should have brought this quiet meat to new heights... but it seemed rather bland. I couldn't taste the aioli in the burger (note to self: stuff a lot more into it?). 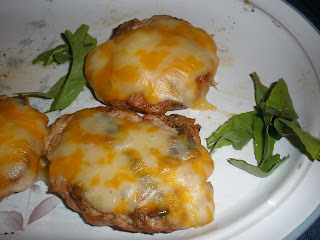 Try it and see what you think: the recipe is here. 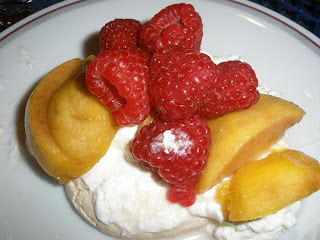 The ginger-peach pavlovas brought smiles and busy dessert forks. I made the meringues and peach part earlier so after dinner - all I needed to do was assemble. All in all - it was a fine summer meal! It utilized all that was still fresh in Minnesota (well, the peaches came from Michigan - so not too far). The syrup that the peaches were in were not too sweet (I'm not good with cloying fruit syrup - I want the fruit to be the star). The late summer raspberries were sweet and tart - and I tend to jam them in my mouth like candy. It was all I could do to save some for the dessert. And I happened to have some extra meringues. Which disappeared later that evening. When there are no leftovers, I am thinking it was a successful meal. Of course when one of the participants is my starving-graduate-student-son - I need to put all in perspective. For he gratefully eats whatever I put on the table. But the biggest success of the cover girl meals so far is bringing family and friends together at least once a month - knowing full well I probably have never made most of the meal before. That's living dangerously. What happens when your play lands in the Principal's office and you are waiting to see if six months worth of work is going to be produced? And you decide to have a yard sale because the college "stuff" from the kids dormitories has made rooms unusable? And you start teaching theatre to grades 1-6 and find grades 1-3 exhaust you so you need to nap? 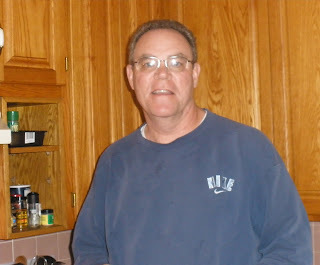 And your son comes home from North Dakota for the weekend salivating for some homemade meals? And then you walk out your door to run errands thinking, "I'll blog tomorrow. I'll visit tomorrow. I'll vacuum - tomorrow." And you step out the door and your ankle twists. You sink to the ground - with the door still open, the blind dog trying to get out, the kitten trying to escape and you watch this technicolor softball develop on the side of your ankle. In slow motion. Well, that was my week. I was awarded the prize for the biggest, most colorful soft tissue in the emergency room. Frozen pesto is my best friend. Really - the dog could cook dinner - well if she could see. 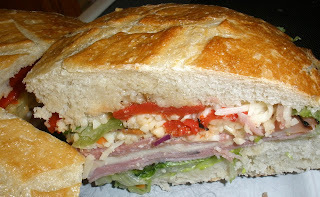 And then there's marvelous muffaletta. Buy your favorite kind of bread - Italian, ciabbata, French, rosemary and olive oil.... dig out some of the white doughy parts (and eat it on the sly). 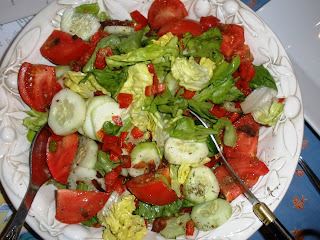 Then fill with olive salad or chopped olives or both and lettuces. 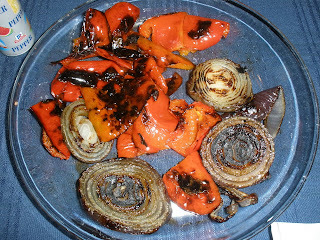 On the other side, fill with roasted red peppers. Douse all with some oil and vinegar. 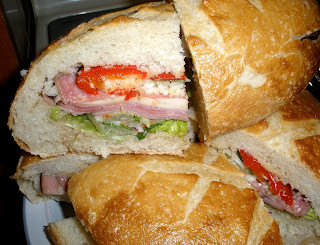 And layer: ham, roast beef, mortadella, salamis, prosciutto, provolone, mozzarella, Parmesan - whatever suits your fancy. Close the sandwich and wrap in foil and smush it all down. And warm it a bit - so all sticks together. Or put a heavy weight on it (really, a brick will do) and stick it in the fridge until ready to serve. Serve hot, warm, cold, make extras for leftovers and feel proud that you could do this even if your right ankle is four times bigger than your left ankle. Even if you're having the worst, no-good-horrible day ever. Even if you wake up the next morning with a cold for the first time in two years. To add to your swollen misery. The muffaletta will see you through. The August Cover Girl dinner was a wee bit late. 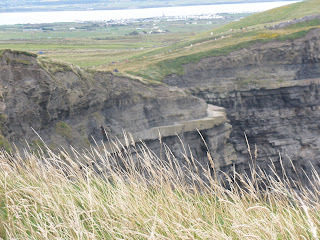 We were in Ireland! Although back stateside, little pieces of my spirit stayed in Ireland to ensure I would return. 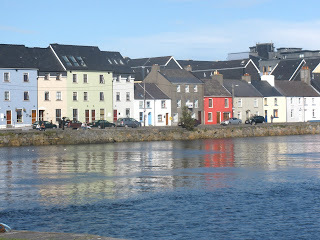 Below is a peek at Galway - in the west of Ireland. 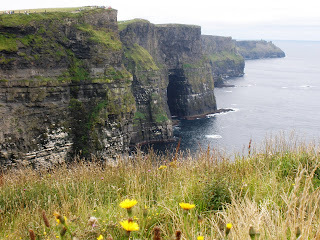 Ireland: Land of faeries, romance, leprechauns, Yeats, Joyce, Guinness and Italian food! I had been told prior to going to Ireland that if I was looking for Shepherd's Pie and Irish stew, I had best stick to the little towns. 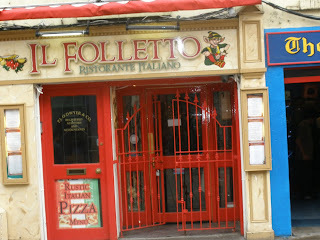 We started off in Galway and indeed found as many Italian restaurants as could be found in Little Italy in New York City. 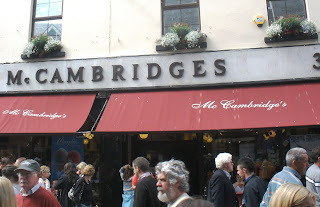 McCambridges on Quay Street provided us with some grand wake-me-up caffeine complete with a small doughnut housing some wickedly, dense dark, velvety chocolate. 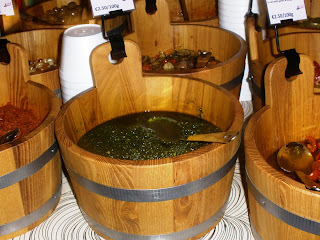 McCambidges also housed the largest vats of pesto I had ever seen. I wondered if there were fields of basil about. 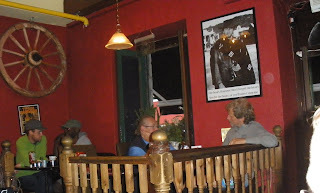 We did have some fresh and filling fish and chips at Rodeo on Quay Street. And remained amused that we had been travelling for over over twenty-four hours only to wind up in an American-western themed bar! With French servers! 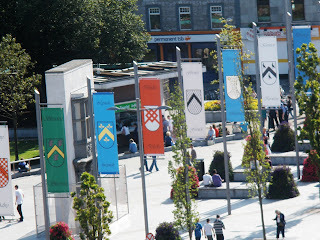 After a wee bit of rest, we found our bearings and embraced the true Irish pubs of Galway. Each one has a story - many dating back to medieval times. 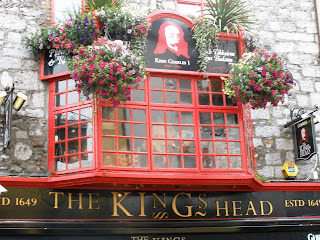 The King's Head on High Street is so named because (much to the misery of the locals) it was taken over by a group of Englishman after the Siege of Galway ended in 1652. One of the officers, Colonel Peter Stubbers boasted there that "he knew the strength of Charles Stuart's neck" implying the he was the executioner of King Charles. He should have remained quiet! When the monarchy was restored he was blackmailed by his listener - a Mr. Deane who used the capital to buy an estate in Balroebuck, Tuam. Is the story true? The Deane's did have an estate in Balroebuck and the Stubbers continued to own the pub until 1912. You decide. 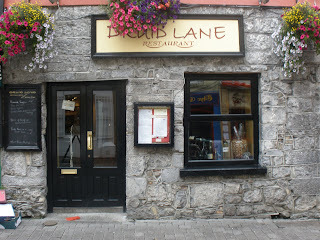 And who cannot be charmed by the Druid Lane Restaurant? Housed in a medieval building (1663), the restaurant offers a diverse menu and wine bar. 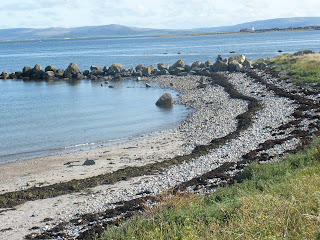 It was the perfect stop after walking the Claddagh and Galway Beach. "Although I can see him still, The freckled man who goes to a grey place on the hill. 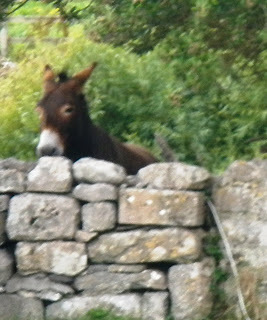 In grey Connemara clothes, At dawn to catch his flies." Yeats. After a day of touring the Burren and the Cliffs of Moher (absolutely do go there, it is quintessential Ireland - magical, enchanting, breathtaking and mysterious), we finally found our traditional Irish meal - at The Western Hotel. 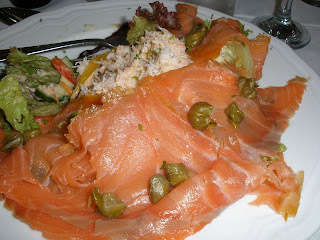 Smoked Salmon mounded around crab salad. James Joyce's favorite Irish meal. Fresh from the Atlantic, delicately prepared with some capers and roasted vegetables, the Irish have elevated salmon into an art. And made our way to east where we would be Dubliners for a few days. 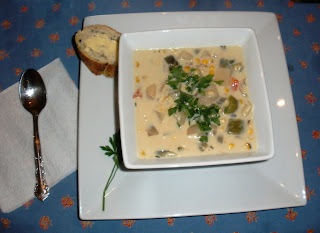 In Celebration: Husbands, Grilled Corn Chowder, Blackbox Wines, an Award and You! I've been doing that musing/thinking I do sometimes. I sometimes shut down for a bit as my mind flits around, focuses for a few moments and then flies in another direction. I am thinking how this is an Italian food blog in which Italian food is severely lacking the last few weeks! Then I rationalize: for what is Italian food - but making good use of the freshest of ingredients and then preparing them so the food is not masked but illuminated. The man who brought me and our kids to Ireland. Where he waited patiently as I took photos of signs, food, street lamps and doorways. The man who built my patio shelving for my birthday to house some of my herbs and vegetables. 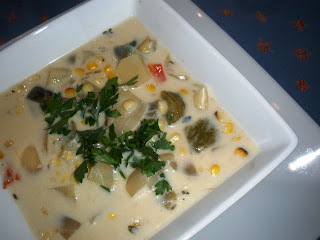 And the man who once a year makes Steven Raichlen's Grilled Corn Chowder. This is no ordinary corn chowder. This is eating the bounty of the season. 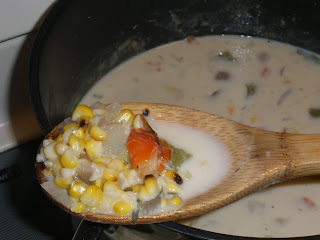 After making this, I promise you will never try another corn chowder recipe again. 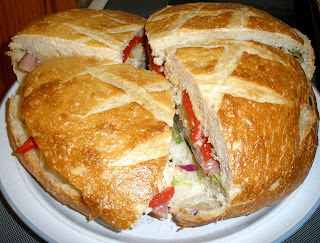 Filled with grilled peppers, onions, thyme - and - and that sweet corn - all at their peak. A spoonful of summer. A feeling that all will be well - even if it;s complicated. Comfort. Home. Nature. Love. Of the sun, the summer, the grill, the vegetables, the herbs, the potatoes, the broth, the sweetness, the tart, the wonder of soup. Made only hours after the ingredients were pulled from the earth. It's a meal. Savor. Make it. I know it has a lot of steps - but make it. You'll thank me. You'll thank Mr. Raichlen. Find the recipe here. (Scroll down, let me know if the link doesn't work for you because you need to make this.) 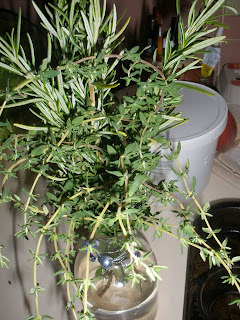 Aside from doubling the thyme, I dot all i's and cross all t's and follow it. It's from THE BARBECUE BIBLE. And as I thank the world, my mother, my aunts, my pets, my children (I do get caught up in thanking moods), I have to give a great big shout out to New Zealand's Black Box Wines for sending me a box of their Sauvignon Blanc. 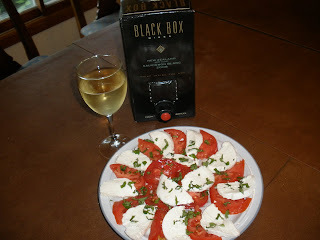 Sauvignon Blanc is one of my favorite summer wines and Black Box does not disappoint. Citrusy and rich in summer aromas, it pairs well with summer vegetable dishes, holds up to strong cheeses and begs for a fruit to be included with your cheese plate. Pour a glass and be greeted by floral aromas. The wine has gotten some rave reviews and with its retail price of $24.99 (the box has the equivalent of 4 bottles of wine) it is grand for entertaining. It pairs easily with a salad just picked from your garden. It's the citrus touch that brings the harvest to life! 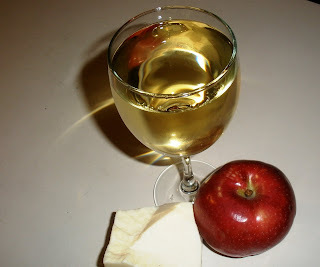 And is a natural for some sharp asiago and a freshly picked orchard apple. I'm searching for some cheddar ... and plan on using it for my Cover Girl Dinner this Saturday eve - where it has to contend with aioli-stuffed turkey burgers and ginger-scented peach pavlovas. I think it's up to the task! And my last thanks - to I love flavor, me who sent me this just short of my trip to Ireland. It was a huge smile for me as is her blog - chock full of grand recipes, food insights and musings of life in the world today. Her blog always delights. Thank you Ruth. I shall answer a few questions and pass it along to my delightful commenters. Whether I actually write about Italian food or go off into my "muse" world, I remain appreciative to those who stay with me and take time out of their precious day to share a few minutes with me. 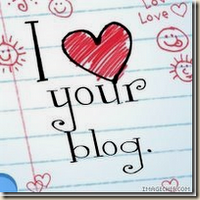 So please - all of you kind bloggers who have been following me - take it and share it with others. Bring smiles. Send it into the world. 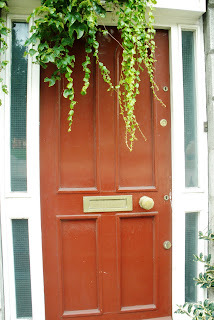 If you'ver commented on my blog - it's yours with grace. Baking! You can't just double what is tasty as I do when I cook. It's chemistry. My Life in France, Courtesy of my husband. The banter between my daughter and my husband. 8. Which language do you want to learn? Italian and finally master French! 9. What do you do when you are feeling low or terribly depressed? 10. Who inspired you to start a blog? Part Julie Powell, part Molly Winzenburg, part me! Please, make the corn chowder and tell me how you liked it! The corn is still here. Simmer summer while we have it.